Democracy is in crisis. Various phenomena such as the electoral success of authoritarian leaders, distrust in public institutions and media, rising social tensions, neo-nationalism and reactionary family politics certify this. But what are the underlying reasons for such developments? Is this crisis democracy’s own crisis, or does it originate elsewhere in the social order? In the early Frankfurt School, analyses of regressive tendencies aimed at tracing political pathologies back to underlying social contradictions, questioning the very compatibility of liberal democracy and late capitalism. Even critiques of individual aspects, such as the authoritarian character, were primarily meant to criticize the societies which produce such effects. Irrationality, as well as reason itself, was attributed not just to individual persons, but also to their collective way of organizing life. But what does it mean to speak of actual and potential reason in society? The idea originated in Hegel’s reconstruction of ethical life and influenced later materialist and sociologist theories of society, which located rationality in societal differentiation, cooperation and integration. However, both the assumption of a systemic cohesion of society in its totality and the ideal of a fully rational order are theoretically demanding and have on various occasions been questioned by critical theorists themselves. In the face of evident unreason, a new assessment of our frameworks for theorizing modern societies and their ensuing criteria for rationality seems pressing and can draw from the strengths of both social and political analyses. Besides classics such as Hegel, Marx, Durkheim, Horkheimer and Adorno we will study contributions by leading contemporary theorists of democracy and society, several of which will be present as instructors. The summer school will involve plenary lectures and discussions, reading sessions, smaller group discussions and panel debates. Only the latter will be open to the broader public. To apply for participation, graduate students and junior scholars are invited to submit a precis of their take on core concerns of democracy, social pathologies and irrationality and a C.V. (Precis and C.V. each 1 page max.). The precis should show which particular background knowledge and systematic positions the applicants would contribute to our joint discussions. There is no fee for the Summer School, but participants have to fund their own travel, accommodation and catering. Instructors: Andrew Arato (New School, NY), Jean Cohen (Columbia University), Fabian Freyenhagen (Essex University), Rahel Jaeggi (HU Berlin), Regina Kreide (Universität Gießen), Frederick Neuhouser (Columbia University, NY). Organizers: Rahel Jaeggi, Eva von Redecker, Isette Schuhmacher, Susann Schmeißer (HSC/Humboldt-University Berlin) in cooperation with the Frankfurt Institute for Social Research and the New School for Social Research (Alice Crary). You can download the Call for Participation here. If you have questions, please consult our FAQs before contacting us. 1) The Call for Participation is targeted at PhD students and junior scholars. Can I apply as an M.A. student or as a Post-doc? Yes, as an M.A. student or as a more senior scholar you may apply as well. 2) May I submit my application in German? No, please submit your precis and your C.V. only in English. 3) May I submit a chapter of my book or my dissertation? No. Please send us a precis of max. 1 page, describing your take on core concerns of democracy, social pathologies and irrationality. 4) When will I be informed if my application was successful? We process the applications as quickly as possible and will get back to you in the beginning of April. 5) How do you select the participants? What are the criteria? Besides looking for the most interesting and fitting approaches to the Summer School’s central questions, we try to achieve a certain geographical and topical balance. 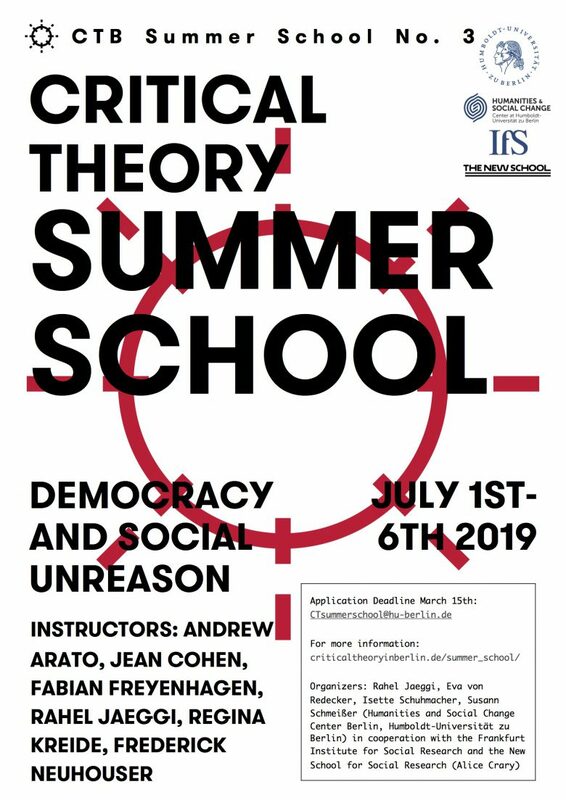 Amongst applications ranked equally, we prefer those scholars which have not attended the Critical Theory Summer School the year before, since it seems fair to give the chance to participate to as many individuals as possible. 6) Are there any participation fees for the Summer School? No, attendance of the course is free. 7) Is there a possibility to get funding for my participation in the Summer School? Unfortunately, this year we cannot assist you with funding. 8) Is it possible to get an official certificate of participation? I need one in order to get funding from my university. Yes, of course. Please send us an e-mail. 9) Do I need a Visa to enter Germany? How do I get a Visa? You can find out here if you need a Visa and what the requirements are. Please find out as soon as possible and let us know right away if you need an official invitation oder confirmation of participation in order to get your Visa. 10) Do you offer accommodation for participants? Can you help me find accommodation in Berlin? No, unfortunately we do not have the capacity to offer assistance with that. Please try and consult the usual online search engines to find accommodation. 11) When will the reading for the Summer School be available? The literature will be available by the end of May. 12) Does the program extend to the evenings? There will be an internal opening discussion on Monday evening, July 1st and one public panel at the evening, July 5th. On the other days, the program is limited to mornings and afternoons, finishing no later than 7 p.m.
13) Are there any social events planned? Every evening there will be a reservation at a restaurant and the possibility to eat with the other participants and instructors, but at one’s own expense. 14) Can I participate in only a few sessions, or for half the week? In order to enable fruitful discussions, we kindly request participants to attend all sessions. 15) Are any of the sessions public? Yes, the two evening panels (July 1st and 6th) are public. 16) Will there be recordings of the sessions?